Paul Leroy Robeson was born on April 9, 1898 in Princeton, New Jersey. While his mother Maria was from a racially mixed background of prominent Quakers, his father William had been born into slavery before escaping to freedom. 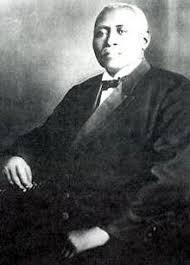 In 1880 his father became the minister of Witherspoon Street Presbyterian Church serving there for 20 years before being removed from his position due to the disapproval of white financial supporters who didn’t like his message of social justice to the all-black congregation. From there his father worked low skilled, low paying jobs. By 1904 Maria was nearly blind from cataracts. She was severely burned in a kitchen accident when an ember from the stove ignited her clothes. She died several days later with burns over 80% of her body. After the death of his mother, the family fell on hard times, eventually loosing their home and moving into the attic of a storefront in Westfield, New Jersey. By 1912 Paul was attending Somerville High School. He graduated high school with an academic scholarship to Rutgers University, becoming the third Black person to ever be enrolled at the school, and the only one in attendance during his time there. While trying out for the football team his teammates played aggressively which resulted in his nose being broken and his shoulder dislocated. He still made the team. As a sophomore he was benched when a Southern team refused to take the field, because they didn’t want to play against a black person. His athletic dominance elicited continuous racial taunts which he ignored. Finally during his junior year he was recognized as a standout player and started receiving media attention from major black publications such as The Crisis for his athletic, academic and singing talents. He became a member of the prestigious Cap and Skull Honor Society. In Rutgers University football uniform. When his father became ill, Paul took on the responsibility of caring for him, shuttling between Somerville and Rutgers. His father died in 1918. During this time, he began to speak out against black people fighting in World War I without having the same privileges as white people in America. Upon his graduation he received varsity letters in multiple sports and won first-team All-American. Renowned sports writer Walter Camp considered him the greatest football player ever. He entered New York University School of Law in fall 1919, becoming an assistant football coach at Lincoln to support himself. Eventually he left NYU and moved to Harlem, where he began attending Columbia Law School. In 1920 he met Elsanda Goode fellow Columbia student. After a year of courtship, they were married in August of 1921. She encouraged his theatrical career greatly, recognizing his talent. 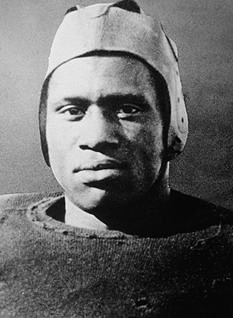 In 1922 he was recruited to play for the NFL's Akron Pros while he continued his law studies. In the spring, Robeson postponed school to portray Jim in Mary Hoyt Wiborg's play Taboo. He then sang in a chorus in an Off-Broadway production of Shuffle Along before he joined Taboo in Britain. After the play ended, he befriended Lawrence Brown, a classically trained musician, before returning to Columbia while playing for the NFL's Milwaukee Badgers. He ended his football career after 1922, and months later, he graduated from law school. Paul briefly worked as a lawyer in 1923, but left after encountering severe racism at his firm. With the encouragement of Eslanda, who would become his manager, he turned fully to the stage. 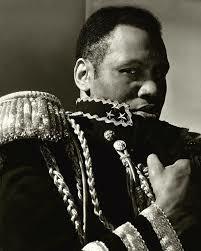 They had one child, a son they named Paul Robeson, Jr. in 1927. Robeson made a splash in the theater world as the lead in the controversial 1924 production of All God's Chillun Got Wings in New York City, and the following year, he starred in the London staging of The Emperor Jones—both by playwright Eugene O'Neill. Robeson also entered film when he starred in African-American director Oscar Micheaux's 1925 work, Body and Soul. 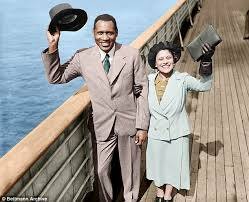 Although he was not a cast member of the original Broadway production of Show Boat, an adaptation of an Edna Furber novel, Robeson was prominently involved in the 1928 London production. It was there that he first earned renown for singing "Ol' Man River," a song destined to become his signature tune. In the late 1920s, Robeson and his family relocated to Europe, where he continued to establish himself as an international star through such big-screen features as Borderline . He starred in the 1933 movie remake of The Emperor Jones and would be featured in six British films over the next few years, including the desert drama Jericho and musical Big Fella, both released in 1937. Robeson's last movie would be the Hollywood production of Tales of Manhattan (1942). He criticized the film, which also featured legends like Henry Fonda, Ethel Waters and Rita Hayworth, for its demeaning portrayal of African Americans. Having first played the title character of Shakespeare's Othello in 1930, Robeson again took on the famed role in the Theatre Guild's 1943-44 production in New York City. The production ran for 296 performances, the longest-running Shakespeare play in Broadway history. A beloved international figure with a huge following in Europe, Robeson regularly spoke out against racial injustice and was involved in world politics. He supported Pan-Africanism, sang for Loyalist soldiers during Spain's civil war, took part in anti-Nazi demonstrations and performed for Allied forces during WWII. He also visited the Soviet Union several times during the mid-1930s, where he developed a fondness for Russian folk culture. He studied Russian, as did his son, who came to reside in the capital city of Moscow with his grandmother. Yet Pauls relationship with the U.S.S.R. became a highly controversial one, his humanitarian beliefs seemingly contrasting with the state-sanctioned terror and mass killings imposed by Joseph Stalin. In the U.S., with McCarthyism and Cold War paranoia running rampant, Robeson found himself contending with government officials looking to silence a voice who spoke out eloquently against racism and had political ties that could be vilified. Fueled by the misrepresentation of a speech the actor made at the U.S.S.R-backed Paris Peace Conference in the late 1940s, Robeson was labeled a communist and was staunchly criticized by government officials as well as some African-American leaders. He was ultimately barred by the State Department from renewing his passport in 1950 to travel abroad for engagements. Despite his immense popularity, he was blacklisted from domestic concert venues, recording labels and film studios and suffered financially. In 1958 Paul released his auto biography, ‘Here, I Stand’. His passport was restored in June 1958 and he embarked on a world tour using London as his base. Back in London, he decided to return to the United States, where he hoped to resume participation in the civil rights movement, stopping off in Africa and Cuba along the way. Essie argued to stay in London, fearing that he'd be "killed" if he returned and would be "unable to make any money" due to harassment by the United States government. Robeson disagreed and made his own travel arrangements, arriving in Moscow in March 1961. During an uncharacteristically wild party in his Moscow hotel room, Paul locked himself in his bedroom and attempted suicide by cutting his wrists. Three days later, under Soviet medical care, he told his son that he felt extreme paranoia, thought that the walls of the room were moving and, overcome by a powerful sense of emptiness and depression, tried to take his own life. Paul Jr. believed that his father's health problems stemmed from attempts by the CIA and MI5 to "neutralize" his father. He remembered that his father had had such fears prior to his prostate operation. He said that three doctors treating his father in London and New York had been CIA contractors, and that his father's symptoms resulted from being "subjected to mind depatterning under MKULTRA", a secret CIA program. Paul stayed at the Barvikha Sanatorium until September 1961, when he left for London. There his depression reemerged, and after another period of recuperation in Moscow, he returned to London. Three days after arriving back, he became suicidal and suffered a panic attack while passing the Soviet Embassy.He was admitted to the Priory Hospital, where he underwent electroconvulsive therapy (ECT) and was given heavy doses of drugs for nearly two years, with no accompanying psychotherapy. During his treatment at the Priory, he was being monitored by the British MI5. Both intelligence services were well aware of his suicidal state of mind. In August 1963, disturbed about his treatment, friends and family had Robeson transferred to the Buch Clinic in East Berlin. Given psychotherapy and less medication, his physicians found him still "completely without initiative" and they expressed "doubt and anger" about the "high level of barbiturates and ECT" that had been administered in London. 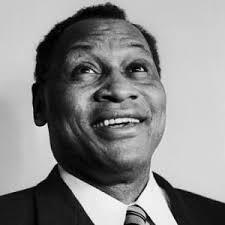 In 1963, Robeson returned to the United States and for the remainder of his life lived in seclusion. He momentarily assumed a role in the civil rights movement, making a few major public appearances before falling seriously ill during a tour. Following the death of his wife Essie in 1965, he settled at his sister's home in Philadelphia where he lived the remainder of his life. On January 23, 1976, following complications of a stroke, Robeson died in Philadelphia at the age of 77. Driving down the street in Philadelphia and i spotted this massive mural on the side of a building. I had to stop!